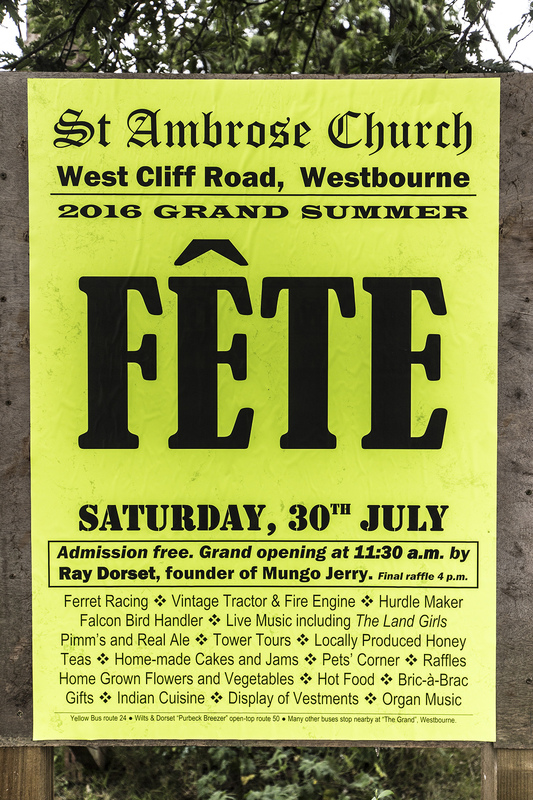 St Ambrose Fête – Saturday 30 July 2016. Response from St Ambrose on the Facebook Page about the St Ambrose Fête. Thanks for posting this! Yes, if you haven’t already done so, please make a note in your diary of our Grand Summer FÊTE on the last Saturday of this month. As you have mentioned we are honoured that Ray Dorset, founder of “Mungo Jerry”, has agreed to open the St Ambrose Fête at 11:30 a.m. He had his daughter baptised at St Ambrose a few years ago. We are also glad to welcome back “The Land Girls”, with nostalgic songs from the 40s and more (performing Noon to 12:45 p.m.), and the group “May Contain Rock” (performing 1:00 – 2:30 p.m.), after which a 30-minute light organ recital will precede the raffle draw – so there should be something for everyone. This year we will be having Ferret Racing for the first time, courtesy of Purbeck Ferret Rescue. A vintage tractor will be accompanied by various static veteran engines, and Westbourne Fire Station hope to display a fire engine (subject to emergency calls). You can sit on bales of hay to watch hurdle maker, David Ewers, demonstrate his craft .Tim Lester will be showing a range of live birds of prey and Kevin Crocker from Rye Hill Farm is bringing a menagerie including baby goats, rabbits, chicks, ducklings and – if they are born very soon – some piglets. St Ambrose is the Patron Saint of Beekeepers and Peter Kay will be selling his locally-made honey. There will also be locally-grown fruit and vegetables, home-made cakes and jams, traditional teas, burgers and hot dogs from Flossies outside catering (yes, the same people who used run Flossies and Bossies in Westbourne! ), Indian cuisine from the Taj Mahal, plus the essential Pimm’s and ale stand. Inside the church there will be a display of Vestments, the usual Tower Tours, stalls including Bric-à-Brac, Jewellery, Gifts, Books, Tombola and Raffles – so do please alert and bring your friends to this classic feature of the Westbourne calendar … “In The Summertime”! So, please make sure you come along to the St Ambrose Fête on Saturday 30 July!